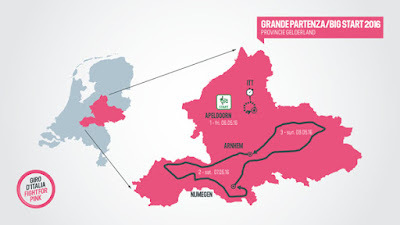 The Netherlands’ Province of Gelderland, will host the Giro d’Italia 2016 start, from 6 to 29 May, organized by RCS Sport / La Gazzetta dello Sport. The 99th edition of the Corsa Rosa will start for the 12th time from outside the Italian borders, it will be the third time from the land of tulips and windmills, following Groeningen in 2002 and Amsterdam in 2010. 1965 San Marino (General Classification winner: Vittorio Adorni); 1966 Monte Carlo – Monaco (Gianni Motta); 1973 Verviers – Belgium (Eddy Merckx); 1974 Vatican City (Eddy Merckx); 1996 Athens – Greece (Pavel Tonkov); 1998 Nice – France (Marco Pantani); 2002 Groeningen – The Netherlands (Paolo Savoldelli); 2006 Seraing – Belgium (Ivan Basso); 2010 Amsterdam – The Netherlands (Ivan Basso); 2012 Herning – Denmark (Ryder Hesjedal); 2014 Belfast – Northern Ireland (Nairo Quintana). Stage 1, Friday 6 May – The first stage, an 8.1km Individual Time Trial, will go through Apeldoorn, finishing in the city. Stage 2, Saturday 7 May – 180km stage for the fastest wheels in the peloton, starting from Arnhem and finishing in Nijmegen. Stage 3, Sunday 8 May – The third stage, which is expected to be a bunch sprint, will start from Nijmegen and end in Arnhem after 190km. Rest Day, Monday 9 May – Rest day and transfer to Italy.